Struggling to figure out how to use Bluetooth® in your new Chevy Malibu? Looking to learn how to use Chevy MyLink or remote start in your Traverse? 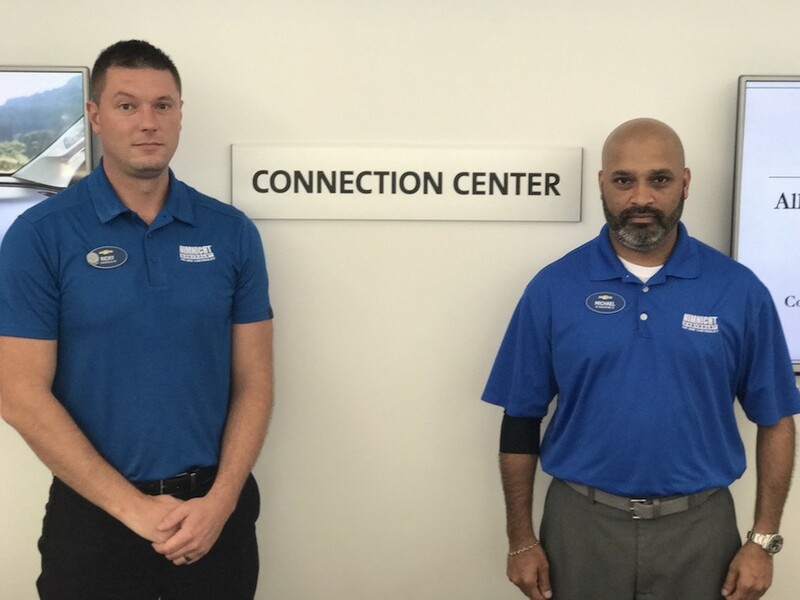 The expert staff at the Jacksonville Chevy Connection Center is here to help you with all things Chevy technology. These days, our vehicles come equipped with a wide variety of advanced technology features. Here at Nimnicht Chevrolet, we understand how difficult it can be to familiarize yourself with these amenities. At the Chevrolet Connection Center, our friendly team members will walk you through the steps of utilizing all the technology your vehicle comes equipped with so you can take on the roads of Orange Park and St. Augustine with ease. Nimnicht Chevy is the only dealership in Jacksonville – and one of the few in the entire country – with a team dedicated solely to helping drivers learn how to use in-car technology. While most dealerships rely on a salesperson to become a Certified Technology Expert, every member of the Chevy Connection Center has earned that accolade. But our staff doesn’t sell cars – they are completely devoted to helping you learn the ins and outs of Chevrolet technology. Don’t plan on buying a new Chevy today? No problem. Whether you buy a car from us or not, our team of experts is happy to help you out. Whether you simply need to connect your phone with your vehicle, synchronize the sound system, or learn how to use Bluetooth® or OnStar, our Certified Tech Expert, Ricky Penick, and his team is here to answer any of your questions. If you need any further assistance with your vehicle, feel free to schedule service at your leisure or watch one of the owner tutorial videos below before stopping by! Introduced in 2016, this feature allows parents to set radio functions, limit the speed of the vehicle, monitor when select safety features are activated, and more. Available on models from 2012 and onward, this feature allows you to remotely control and monitor features from the convenience of your smart phone. Nimnicht Chevy is proud to be the only dealership in Jacksonville to boast a staff of Certified Technology Experts (CTEs). Meet our team today! Only 1000 of these vehicles were produced in total, and this collector’s edition offers luxurious, sporty style inside and out. Find out how to pair your Android to your 8-inch MyLink system to use Bluetooth® features in your Chevy Vehicle. Learn how to pair your smartphone with the MyLink system to take advantage the next-generation technology in your Chevy. Find out how to use the Adaptive Cruise Control feature to keep you and your passengers more secure on the roads of Jacksonville. Get to know Ricky Penick, GM master Certified Technology Expert here at our Chevrolet Connection Center. Learn more about the 2016 Chevrolet Malibu has to offer, including impressive gas mileage, sporty style, and advanced tech features. Setting up Teen Driver Technology is as simple as a few easy steps. Watch this video to learn how to set your pin, manage your settings, and access your teen’s driving report card. Find out how to pair your iPhone to your 8-inch MyLink system to use Bluetooth® features in your Chevy Vehicle. Find out how to pair your iPhone to your 7-inch MyLink system to use Bluetooth® features in your Chevy Vehicle. Learn how to set up your OnStar 4G LTE Wi-Fi hotspot to enjoy the most comprehensive in-vehicle safety and connectivity system available. Want more info? Schedule an appointment or Contact our Connection Center directly today!